01 - Variations Under Domestication 01-08 - Breeds of the Domestic Pigeons, their Differences and Origin 20 In the skeletons of the several breeds, the development of the bones of the face in length and breadth and curvature differs enormously. The shape, as well as the breadth and length of the ramus of the lower jaw, varies in a highly remarkable manner. The caudal and sacral vertebrae vary in number; as does the number of the ribs, together with their relative breadth and the presence of processes. The size and shape of the apertures in the sternum are highly variable; so is the degree of divergence and relative size of the two arms of the furcula. The proportional width of the gape of mouth, the proportional length of the eyelids, of the orifice of the nostrils, of the tongue (not always in strict correlation with the length of beak), the size of the crop and of the upper part of the oesophagus; the development and abortion of the oil-gland; the number of the primary wing and caudal feathers; the relative length of the wing and tail to each other and to the body; the relative length of the leg and foot; the number of scutellae on the toes, the development of skin between the toes, are all points of structure which are variable. 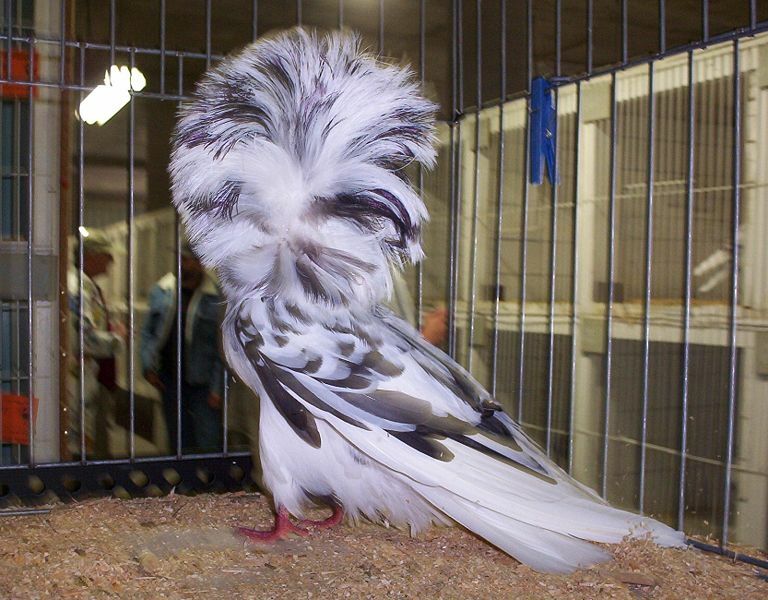 The period at which the perfect plumage is acquired varies, as does the state of the down with which the nestling birds are clothed when hatched. The shape and size of the eggs vary. The manner of flight, and in some breeds the voice and disposition, differ remarkably. Lastly, in certain breeds, the males and females have come to differ in a slight degree from each other. 01 - Variations Under Domestication 01-08 - Breeds of the Domestic Pigeons, their Differences and Origin 30 Altogether at least a score of pigeons might be chosen, which, if shown to an ornithologist, and he were told that they were wild birds, would certainly be ranked by him as well-defined species. Moreover, I do not believe that any ornithologist would in this case place the English carrier, the short-faced tumbler, the runt, the barb, pouter, and fantail in the same genus; more especially as in each of these breeds several truly-inherited sub-breeds, or species, as he would call them, could be shown him. 01 - Variations Under Domestication 01-08 - Breeds of the Domestic Pigeons, their Differences and Origin 40 Great as are the differences between the breeds of the pigeon, I am fully convinced that the common opinion of naturalists is correct, namely, that all are descended from the rock-pigeon (Columba livia), including under this term several geographical races or sub-species, which differ from each other in the most trifling respects. As several of the reasons which have led me to this belief are in some degree applicable in other cases, I will here briefly give them. 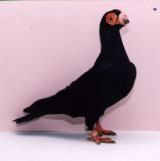 If the several breeds are not varieties, and have not proceeded from the rock-pigeon, they must have descended from at least seven or eight aboriginal stocks; for it is impossible to make the present domestic breeds by the crossing of any lesser number: how, for instance, could a pouter be produced by crossing two breeds unless one of the parent-stocks possessed the characteristic enormous crop? The supposed aboriginal stocks must all have been rock-pigeons, that is, they did not breed or willingly perch on trees. 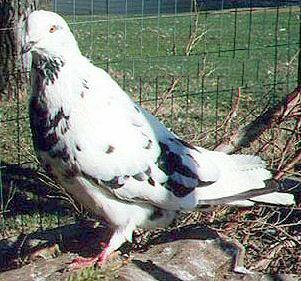 But besides C. livia, with its geographical sub-species, only two or three other species of rock-pigeons are known; and these have not any of the characters of the domestic breeds. Hence the supposed aboriginal stocks must either still exist in the countries where they were originally domesticated, and yet be unknown to ornithologists; and this, considering their size, habits, and remarkable characters, seems improbable; or they must have become extinct in the wild state. 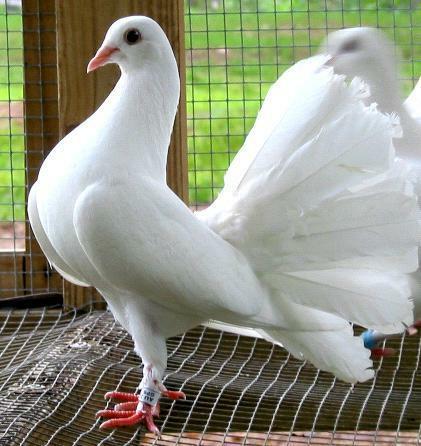 But birds breeding on precipices, and good fliers, are unlikely to be exterminated; and the common rock-pigeon, which has the same habits with the domestic breeds, has not been exterminated even on several of the smaller British islets, or on the shores of the Mediterranean. 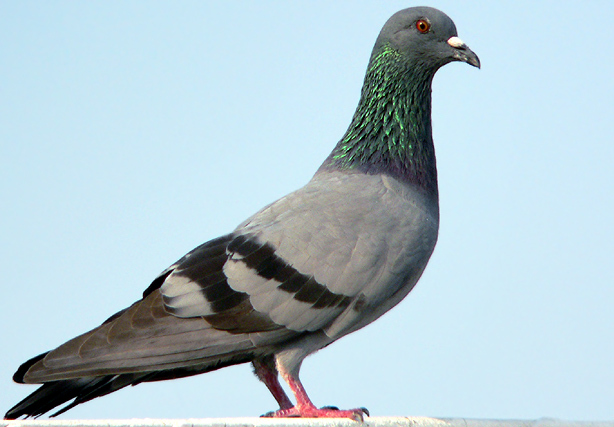 Hence the supposed extermination of so many species having similar habits with the rock-pigeon seems a very rash assumption. 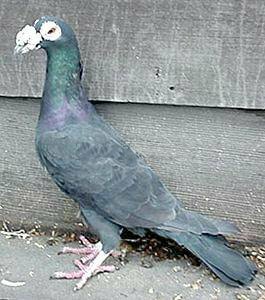 Moreover, the several above-named domesticated breeds have been transported to all parts of the world, and, therefore, some of them must have been carried back again into their native country; but not one has become wild or feral, though the dovecot-pigeon, which is the rock-pigeon in very slightly altered state, has become feral in several places. 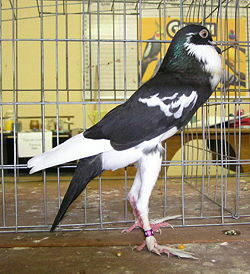 Again, all recent experience shows that it is difficult to get wild animals to breed freely under domestication, yet on the hypothesis of the multiple origin of our pigeons, it must be assumed that at least seven or eight species were so thoroughly domesticated in ancient times by half-civilised man, as to be quite prolific under confinement. 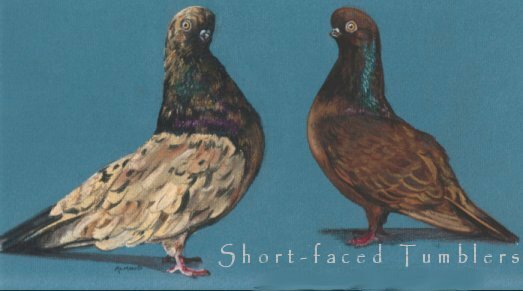 An argument of great weight, and applicable in several other cases, is, that the above-specified breeds, though agreeing generally with the wild rock-pigeon in constitution, habits, voice, colouring, and in most parts of their structure, yet are certainly highly abnormal in other parts; we may look in vain through the whole great family of Columbidae for a beak like that of the English carrier, or that of the short-faced tumbler, or barb; for reversed feathers like those of the Jacobin; for a crop like that of the pouter; for tail-feathers like those of the fantail. Hence it must be assumed not only that half-civilised man succeeded in thoroughly domesticating several species, but that he intentionally or by chance picked out extraordinarily abnormal species; and further, that these very species have since all become extinct or unknown. So many strange contingencies are improbable in the highest degree. 01 - Variations Under Domestication 01-11 - Unknown Origin of our Domestic Productions 50 These views appear to explain what has sometimes been noticed- namely, that we know hardly anything about the origin or history of any of our domestic breeds. But, in fact, a breed, like a dialect of a language, can hardly be said to have a distinct origin. Man preserves and breeds from an individual with some slight deviation of structure, or takes more care than usual in matching his best animals, and thus improves them, and the improved animals slowly spread in the immediate neighbourhood. But they will as yet hardly have a distinct name, and from being only slightly valued, their history will have been disregarded. When further improved by the same slow and gradual process, they will spread more widely, and will be recognised as something distinct and valuable, and will then probably first receive a provincial name. In semi-civilised countries, with little free communication, the spreading of a new sub-breed would be a slow process. As soon as the points of value are once acknowledged, the principle, as I have called it, of unconscious selection will always tend,- perhaps more at one period than at another, as the breed rises or falls in fashion,- perhaps more in one district than in another, according to the state of civilisation of the inhabitants,- slowly to add to the characteristic features of the breed, whatever they may be. But the chance will be infinitely small of any record having been preserved of such slow, varying, and insensible changes.